Home › Oily Skin › NIA24 Eye Repair Complex, 0.5 oz. NIA24 Eye Repair Complex, 0.5 oz. This ultra-rich eye repair cream quickly penetrates to deliver critical anti-aging, firming and brightening actions to the total eye area. Correct today’s imperfections - from darkness to puffiness to lines - while fighting future damage. Continuous, deep delivery of Pro-Niacin® strengthens the skin barrier. Pro-Niacin® is clinically shown to visibly improve skin tone, texture and hyperpigmentation. Peptide blend reinforces collagen and elastin to visibly reduce fine lines and wrinkles. Vitamin C, Licorice and White Birch visibly brighten to illuminate under eye discoloration. Caffeine helps to reduce the appearance of puffiness. Water (Aqua/Eau), Butyrospermum Parkii (Shea Butter) Oil, Myristyl Nicotinate, Glycerin, Glyceryl Stearate,Cyclopentasiloxane, Isopropyl Palmitate, Dimethicone, Hydroxyethyl Urea, Paraffin, Butylene Glycol,Pyrus Malus (Apple) Fruit Extract, Arctostaphylos Uva Ursi Leaf Extract, Betula Alba Leaf Extract,Glycyrrhiza Glabra (Licorice) Root Extract, Morus Alba Bark Extract, Sesamum Indicum (Sesame) Seed Oil,Myristica Fragrans (Nutmeg) Kernel Oil,Tocopheryl Acetate, Oxacyclohexadecenone, Methyldihydrojasmonate, Maltol, 1 ,5,5,9-Tetramethyl-13-0xatricyclo(8.3.0.0(4,9))Tridecane, Palmitoyl Hexapeptide-19,Tetrahexyldecyl Ascorbate, Panthenol, Caffeine, Palmitoyl Oligopeptide, Palmitoyl Tetrapeptide-7, Sodium PCA, Urea,Trehalose, Polyquaternium-51, Sodium Hyaluronate, Triacetin, Soy Isoflavones, Hydrolyzed Soy Protein,Ursolic Acid, LIomastat, N-Hydroxysuccinimide, Steareth-20, Chrysin, Polysorbate 20, Carbomer, Dextran, Propylene Glycol Dicaprylate/Dicaprate, Cetyl Phosphate, Stearyl Alcohol, Cetearyl Alcohol,Peg-40 Castor Oil, Polysilicone-11, Polyacrylamide, C13-14 Isoparaffin, Laureth-7, Propylene Glycol, Tetrasodium EDTA, Potassium Sorbate, BHT, Dehydroacetic Acid, Benzyl Alcohol. 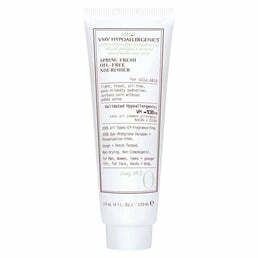 VMV Hypoallergenics Spring Fresh Oil-Free Nourisher, 4 fl. oz. PCA Skin Sheer Tint Broad Spectrum SPF 45, 1.7 Oz. NIA24 Intensive Recovery Complex, 1.7 oz.